The trouble with flying and other stories is the second collection I’ve read from the Margaret River Short Story Competition. I greatly enjoyed last year’s collection, Knitting and other stories, so was very happy to read this one. I’m pleased to see Margaret Press maintain its commitment to publishing stories from the competition, and hope that annual publication will help both the competition and the press, itself. There were apparently 218 entries for the 2014 competition, which is somewhat fewer than last year’s 260 entries. Stories came from every state in Australia, as well as one from New Zealand. They include both new and experienced writers, many of whom have won awards and/or been published in some of Australia’s best literary journals. I was pleased to see that four of the 24 writers included in this volume, appeared in last year’s collection. Last year, 20 of the 24 stories were by women, and the trend continues this year with 21 being by women. Presumably this roughly reflects the gender ratio of the overall entries. I wonder why this is? Is writing short stories something women who want to write feel they can juggle more easily with other responsibilities? Or? I’d love to know whether this is a common pattern, and why it might be. Finally, before I get to the stories, I should say that of course the collection includes the winner, runner-up, and five highly commendeds, as well as the winner and two highly commendeds in the special award for writers from the South West (where Margaret River is located). They didn’t all accord with my favourites, but that’s the subjectivity of reading isn’t it? 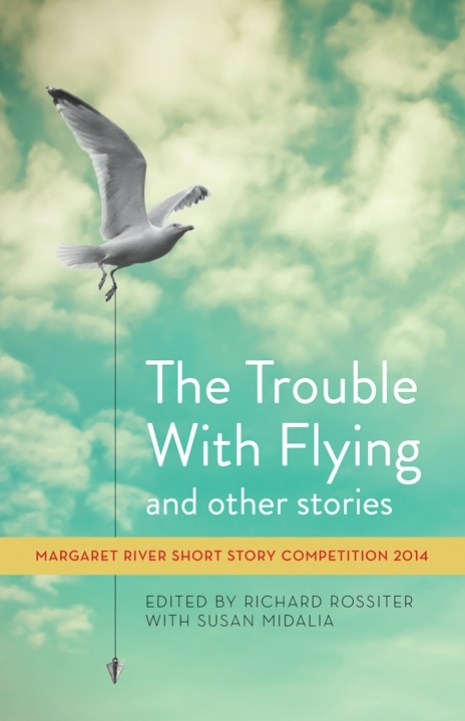 Like last year’s collection, the title comes from winning story, Ruth Wyer’s “The trouble with flying”. In the bios, we are told that Wyer is “a fledgling writer from south-west Sydney”. Fledgling she may be, but she has a delightful way with words. It’s a story about transitions, about Rita, an unconfident young girl, moving from high school to TAFE. Intriguingly, Rita doesn’t appear until a few paragraphs in, which disconcerts the reader somewhat as to who this story is about. It is in fact quite an unsettling story, combining humour with pathos and a sense at the end that Rita may not break free of “the loosely bound fog” that she feels envelops her. Flying, in other words, is not easy. It’s a bit cute to say, I suppose, but in many of the stories the characters struggle to fly, to escape the concerns that mire them – and, in fact, some don’t. One who doesn’t is the immigrant mother in Linda Brucesmith’s “A bedtime story”. Ridiculed by her husband one too many times, she leaves the house after midnight. Another mother in trouble is Annika in Cassie Hamer’s “A life in her hands”. Overwhelmed by a colicky baby – and oh, how I related to that – she decides that “escaping together would make them both much happier”. So, like the mother in “A bedtime story”, she heads to the sea. There, the kindness of one young man and the near tragedy of another shocks her to her senses and she feels “the euphoria of a lucky escape, a second chance”. Life for some, we realise, can often hang on little chances that determine the decisions we make. A mother of a different kind is Tara in Lauren Foley’s entertainingly titled “Squiggly arse crack”. This is a bright, breezy story about an older single mother enjoying her “staycation”, that is, a brief shopping expedition away from her beloved child, Squig. To ensure she doesn’t change her mind about leaving him with her friend, she “sashays” out the front door without looking back, “pretending her neck is in an Elizabethan collar or pet lampshade”. I know how sweet I am, in men’s eyes that follow my movements. I look younger than my age, with my dense hair and lustrous skin. I know they want to taste me on their tongue. But they are wrong: I’m no honeysuckle. Glen Hunting’s Martha in “Martha and the Lesters” is spirited too. The story is told by Martha’s lodger, who is – no, not Lester. The Lesters are the spiders which proliferate in elderly Martha’s rather untidy home. Our narrator Roland, for that’s his name, describes the Lesters going about the business of life – reproducing, eating, sometimes other insects, sometimes each other. They play a complex role in the story. Martha feels blessed by their presence, and yet, as we see, their lives represent “gluttony and violence writ small”. Perhaps that’s the point. Unlike Martha’s children, they accept her, don’t judge her, and don’t pretend to be other than they are! Continuing in the vein of positive stories is Kate Rotterham’s “Potholes” about a rather curmudgeonly, recently retired husband and father, Les, “who was surprisingly confident in diagnosing a range of mental disorders” in those around him, but who, delightfully, does a complete about-face at the end. There are, though, some devastating stories such as Bindy Pritchard’s second-prize winner “Dying” about a rural mother with terminal cancer, and Leslie Thiele’s portrait of a man with dementia in “Catching trains to Frankston”. The challenge of ageing, in fact, appears several times in the collection. I enjoyed Kathy George’s story, “Walking the dog”, about a lonely old widower who, like Martha in Hunting’s story, is confronting the limits of his independence. Not surprisingly, the collection encompasses many concerns currently facing Australians, with issues like ageing, cancer and fire appearing in several stories. Indigenous issues and our multicultural make-up also appear, albeit way less frequently, reflecting I’m guessing the backgrounds of the writers. It would be good to see more diversity here – but that is another discussion methinks. And now for the apology. I would love to comment on every story in this collection, not only because each has something to offer but because I know writers (like all of us) love feedback. I can imagine, if I were a writer, coming to a review like this wondering whether my story would be featured. All I can say is that many of the stories, besides those I’ve chosen to write about here, touched me. I’m sorry I couldn’t mention them all. “Practise senseless acts of beauty” is one of the instructions Harry (“Potholes”) reads in Ten Ways to a Happier Life. I’m so glad the writers in this volume had a go at their own “acts of beauty”. They’ve given me much to ponder. I was interested to read your comment that short stories can tend to veer toward the resigned or melancholic. I wonder why this is. Perhaps that’s why my favourites (in this collection) tend to be the more upbeat. Maybe it is merely because those stories jump out at me with their humour and sass. Yes, Karenlee, I think the upbeat ones do stand out with their sass and humour because they are rarer. I think the fact – and I think it is a fact from my experience – that more are melancholy or at least serious – is because writers tend to focus on the challenges in life more than the joys. Do we just enjoy the joys but want to explore the downs? Perhaps it’s like Tolstoy’s every happy family is alike but the unhappy ones are different? I greatly appreciate your reviews, both of you. Thank-you. The problem of rendering joy in literature is that it doesn’t lend itself to drama and conflict, or at least not directly. I always return to Chekov’s contention that, when we’re writing about things that really matter, we’re rendering an aspect of experience that part of us wishes wasn’t so – we would prefer that its happier opposite was the truth instead. The importance of those ‘hard truths’ are heightened by an awareness of the happiness that is (temporarily) missing, and I’d argue that neither makes sense without the context of the other. But the other is still an ‘other’ and, thus, difficult to bring directly into a tale which is essentially dark or downbeat. Irony and humour, of course, are great for preventing things from becoming too maudlin. They’re like acts of defiance that simultaneously acknowledge the underlying seriousness of the subject matter,by their very presence. Overdo them, though, and you run the risk of appearing glib or trite. Sounds great, Sue ! Yet another of the countless examples of my ignorance of what to attempt to write for. Thanks Glen for commenting. (BTW I’ve fixed the “flappy [oh dear!] families” to “happy”. That was courtesy the iPad and I clearly didn’t notice). Yes, what you say re drama and conflict (and Chekhov’s view) makes perfect sense. It’s sort of what I meant but didn’t really articulate well at all, i.e. that challenges tend to involve drama and conflict, things that need to be explored. And yet joys are an important part of life and deserve a little more treatment I reckon. Why is it so hard to hang onto? I need to think a little more about the idea of the “things that really matter” being the hard things. Lauren Foley’s mother is joyful about her baby, and yet Foley found things to explore. Such joy may, I guess, be easier to manage in a short story than sustain in a long novel, though, for that issue of conflict/drama. I love your comment that irony and humour are acts of defiance. As someone who doesn’t mind spiders – though just one or two in the house at a time thank you very much – I loved the Lesters, and loved how you tied it into a story about ageing and independence. Crazy old lady is a cliche only because there’s an element of truth – the trick for the writer is to bring out that truth, nest-ce pas? I loved your ‘all flappy families’…I was going to mention this time, even if you didn’t! Carmel Bird puts it another way in Dear Writer – something like “The thorns are the meaning of the rose. But we should never forget about the rose. Ever.” At the risk of sounding really mushy and ghastly, joy and sorrow give each other their power and poignancy. Either one without the other, or too much of one, becomes almost senseless. And yet none of us, in our happier moments or periods, say to ourselves “I think it’s time for some pain.” We’re all vulnerable. If we weren’t there would be no significance in any of the things we tell stories about. It’s that vulnerability that really lifts happiness out of being de rigeur and gives it real value. I do have Carmel Bird’s book here and have dipped into it – but haven’t dipped into that bit! I like that description, and the admonition to never forget the rose. Thanks Gemma …. Sounds like you enjoy short stories then, which is great. Loved your review as always, Sue. I’ve not finished the collection and I’m not reading it in order, but so far, I’m loving what I’m reading—the standard of stories in this publication is always so high. I was also lucky enough to be at Varuna with Isabelle Li and have heard more of her work. She has a wonderfully lyrical turn of phrase, and an uncanny ability to spot beauty and put it into words. ‘Squiggly Arse Crack’ is superficially a hoot to read, but as you say, behind the humour is the anxiety. I know you couldn’t mention all of the stories that you enjoyed, so I’ll mention two more of mine! (If you don’t mind …) I loved Rosie Barter’s story, ‘Grasping for the Moon’, about an older lady admiring her younger lodger. And Kristen Levitzke’s ‘Dot’s Garden’ about a husband reflecting on his infidelity. It’s a wonderful collection and I hope it gets the attention it deserves. Oh thanks Louise. How bold reading them out of order! LOL. A year or so ago, I was talking to Irma Gold who compiled The invisible thread anthology. She commented on how sad she felt when people read it out of order because of all the work she’d put into the order! I had been picking and choosing at will from it, but when I read it for my reading group, I went back and read in order. I did, though, read Barbara Baynton’s Bush studies out of order. I’m joking really because I completely understand why one would read a book like this out of order. Thanks for your input into the stories. Yes, I loved Li’s language – and noted in the bios that she’d been at Varuna. Thanks too for adding some of your favourites. They are good too. In fact I was thinking last night that none really fell flat in any major way, which I suppose is not surprising since they were chosen from over 200. There were a lot of stories in this one about older people weren’t there? An interesting discussion of the different moods and emotion in short stories. I particularly enjoyed Glen’s comments about happiness and sadness. And harking back to our earlier discussion, I was thinking that a short story can be about an emotion or a mood. It doesn’t have to concern itself with ‘what happens next’. Yes, that’s very true Dorothy. I was thinking the same … It can be a “mood piece” … Sharing some of the features you can find in a poem. It’s a lovely form. What a wonderful collection. The prize people are really on a role! Though I must say at first glance, the cover of the book appears to show the seagull, um, releasing something, which is a sort of disturbing until I looked at it a little closer! Ha ha Stefanie .. I’ve seen other comments about the cover. I do think last year’s Knitting cover was prettier! Anyhow, yes, it is a lovely collection as you can clearly tell. Oh yes, bliss for sure, Hannah. And I have so many short stories to read. It’s taken me a while to find my way here but I finally did. I just wanted to say thanks for the kind words about my story. It’s a great collection and I am thrilled to be included. Thank you for taking the time to read and review it. Haha, Kate, you are one of the lucky ones to have been mentioned! I did enjoy your story a lot – such a great idea and nicely characterised. I enjoyed how Les goes back to work and sees it all from another perspective.